ENVIRONMENTAL ASPECTS IN YOUR ENTERPRISE – BENEFITS AND OPPORTUNITIES. Representatives from food industry and the industry of building materials, as well from other industruies and environmental service providers (ESP) were participating at the training. Following topics were covered: Introduction to environmental legislation, measurement needs of emissions, correlation with other national legislation, IPARD funding opportunities, characteristic emissions to environmental media from sectors and their impacts, good practices and measures to reduce the negative impact on the environment, procedures in case of emergency or accident, waste management with practical workshop and ways for improving environmental performance trough common sustainable practices, implementation of environmental management systems & increased social responsibility. The participants gave very positive feedback and expressed their interest in further trainings on environmental aspects in their bussiness. 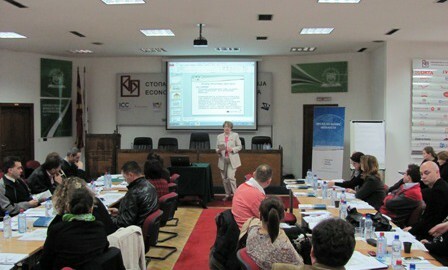 The training was an excellent opportunity for the companies to share good practices and exchange contacts.